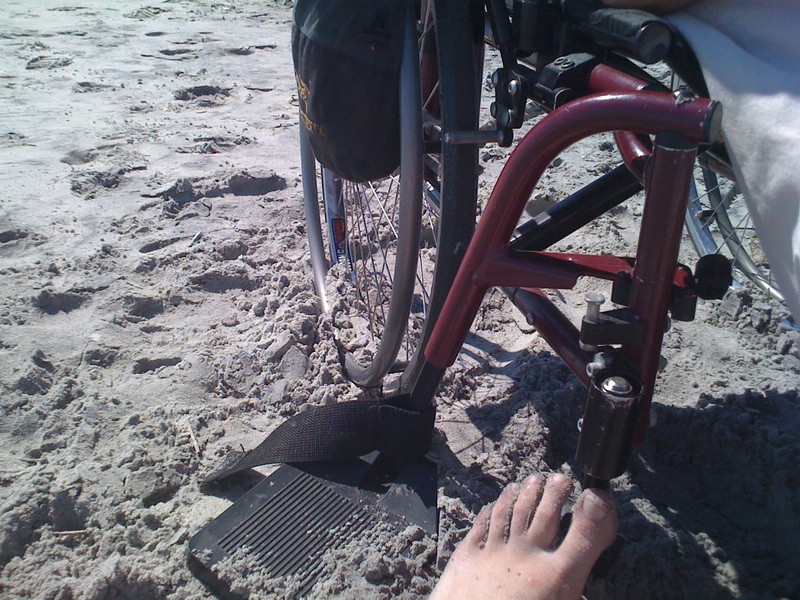 Playing in the sand was fun, but wheelchairs can also be hazardous to your health! This week was turned upside down, literally. I don’t know what it was- the time change, movement in other areas of our lives, but it was one strange week. Monday afternoon, I found Barton at his next computer, unable to move his wheelchair out of position. All of a sudden, there was a flurry of logistics that had to be altered and calls to the computer repair, and a discussion of what now. Luckily, he was able to get a temporary joystick on Tuesday until we are able to purchase another, a $500 replacement. And we thought we were finally treading above water. Monday night, however, I woke up in the middle of the night, and in my dream-state, ran head on into Barton’s manual chair sitting in the middle of our bedroom. I thought I had only stubbed the skin off my toe, and went back to sleep without another thought. Yet, in the morning, I felt a horrible pain in the back of my ribs. In running into Barton’s wheelchair, I had crunched my whole body. I was unable to catch my breath, and every movement just plain hurt. I grabbed an ice pack, and we took extra care in getting Barton up, using a back brace to make sure I was stable. The appointment to my dear neighbor and chiropractor Donna Hedgepeth couldn’t come fast enough, and I’m so appreciative how she was able to move things back into place. All week, I’ve had to take it slow- move slow, work slow, focus on my body and what I am doing, even if I am sitting at my computer. It’s taught me to be more patient with myself. And Barton took more care too- refusing to let me pick him up if I didn’t have the back brace on. Now, to be honest, this is not the first time I have run into Barton’s wheelchair. It’s just one of those things. One time, when the weather was gorgeous, we were running together. Barton had the dogs and I was behind him- just trying to keep up. We saw two women who waved and said hello. Barton stopped- and I didn’t- it was a full on impact. I wondered how funny it would have looked to the two women who had gapped at our position, as I almost flew over the top of the handlebars. I admit, too that I have run Barton into people, waiting in line, not paying attention. It’s easy to do- there’s a whole spacial shift that takes place- with a metal frame and foot petals. 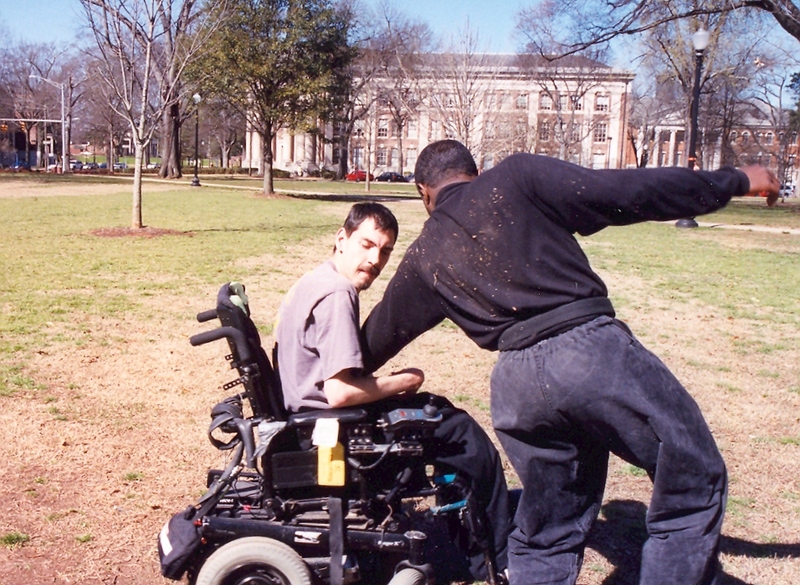 Many people ask how Barton can train in martial arts with a wheelchair. Believe it or not, a wheelchair provides many hard and sharp angles, hidden places to wedge an opponent’s foot or arm- and that’s when Barton’s in his wheelchair. It’s an entirely different issue when the wheelchair is empty, and apparently the opponent is me! All clear for take off: Barton training in AL. A couple of night ago in martial arts class, we were working on a technique that had a particularly light feel. The person who I was working with was a rather large guy who tends to rely on his muscle to make techniques work rather than relaxation and body mechanics. With just as much grace and softness, he dropped the same 200-pound guy with a turn of his head and a bend at the waist. I got a feel for how to maintain that feeling of easy playfulness despite what the attacker was bringing to the interaction and tried again. As I began to incorporate the feel, I noticed that the less effort I put into making it work, the better the outcome. Toward the end of class, the technique came more easily to me, and what I began to notice was that as I moved and allowed myself to have patience with my own movement, the rigidity and tension in my training partner began to dissolve. There were even a few times where, after he collapsed onto the floor, we looked at one another and wondered, how the heck did that even happen. All we knew was that one minute he had tried to punch me and the next he couldn’t stand and was on the ground. The next morning, Megan and I were chatting about how busy the past few months have been, and how there was still a feeling that in spite of all we had done, there was still even more to do. And we wondered how on earth we would ever get through it all. Don’t get me wrong, all of this work is dear to both of our hearts and we are completely excited by every facet of it. Yet, the sheer quantity of “to do’s” is at times overwhelming. All of a sudden, the lesson from the night before flashed in my head. I laughed as I looked Megan deeply into the eyes. “What’s so funny?” She questioned. And so we did. As I suspected, it worked itself out just as the technique in class had the night before. No effort required, just a soft touch and a light heart. One of my mentors talked to me about how as creative peoples, we have a tendency to go until we drop, especially when we get inspired. It happens to me when I get on a writing kick- I’ll wake up at 2am, writing before a full day of work, and find myself crashing the next day at six or seven in the evening or I get so wound up I can’t go to sleep. I feel that if I don’t get it down on paper at that moment, it’s gone. And I mentioned about how- no matter how early I get up, ten minutes before I leave the house, I tear through every room finding keys, papers, notebooks, lesson plans, phone, books. There may be times when I am working on two lists- what I need for the day and what Barton needs for the day. I was reminded to slow down, on a couple of fronts. To prepare for the next day, not just in logistics, but also in projects. I noticed a huge shift when I found myself ten minutes late, and I was not freaking out at all. I moved from one place to another, and I found myself actually on time for the event. I’ve also felt like I’ve planned projects out better, giving myself enough time to complete them, and while nothing seems to go as I fully expect, I’m able to adapt to necessary changes in flow or needs. Yet, I’ve completely resisted the notion of slowing down that I know will smooth the day out even more. During this time of planning multiple events, creating new brochures and working on the best ways to reach new youth and families, I’ve been itching to get to the to-do list. It all seems to go too slowly for my racing mind. On the days when Barton & I have worked together, we’ve been focused and while we may have only gotten one item off of the long list, we know that we’ve done it well, and that has been a great feeling. It’s amazing to me how growth comes. Recently, Megan and I caught the inspiration to reorganize our house to make space for a creativity studio. This studio, as we envision it, is intended to be as shared space where the two of us can work together, see clients, and serve as a room for creative play as we build our new business. In only a weekend Megan had excavated our dining room, and embarked on designing the space to meet its new destiny. It soon adorned a padded floor, a comfy arm chair fit for coaching clients, bookshelves filled with games and children’s books fit for a range of ages and desk waiting to support a range of creative projects. In the process, we found ourselves not only re-evaluating the space for this room individually, but we also began to examine how we were utilizing space throughout our house and the further we explored the greater transformation took place. As we assessed each furniture item for the purpose it served our family, we noticed that our relationship to it shifted as we assessed it in relation to a new vision for our lives, both as a family and as business partners. As Megan, in particular, went through items associated with her family’s history, I noticed that there was a clear shift in her priorities, which, to be honest, amazed and excited me. I have always been one to hold a deep value of open spaces and utility in my personal possessions, and many times, I have been somewhat extremist in my drive to eliminate the unnecessary. Megan, however, grew up with what I understand to be a different set of values in which the sentimental value of an item was highly prized and therefore justified its place within her space. Because of this, I have learned over time to curb my urge to purge. You can imagine my amazement then, when it was she who went on a purging spree. At first, I was somewhat hesitant to join her, and in fact at the beginning of the process, I was the one making sure that nothing got purged that she would later regret. Yet, as we went through the process and I gained confidence in her vision and commitment, we both had a great deal of fun getting rid of what was outside of our new vision. What emerged from this process was quite unbelievable. 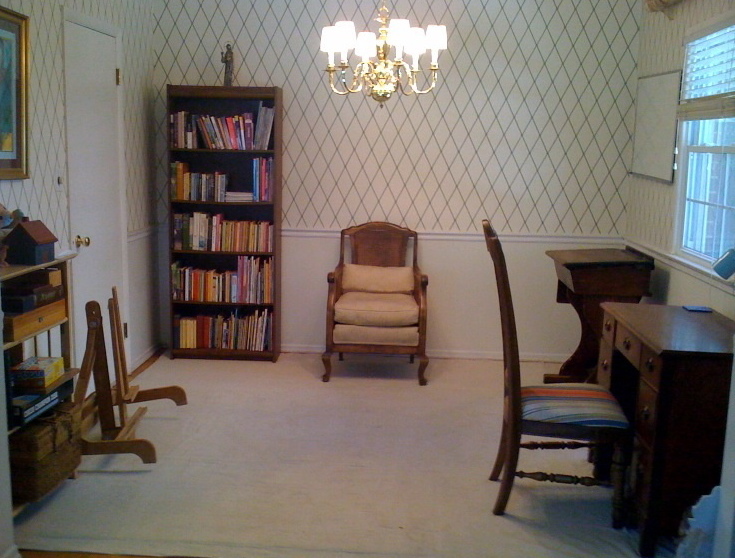 Virtually every room in our house was transformed into an open and spacious environment. About two months ago, I was looking at our dining room, filled with my mother’s dining room table, china cabinet, two bookcases and chairs. The black lamp covers sat on top of chandelier lights, untouched since we had moved into our house. I always thought that the room just looked dark and cramped. Unfortunately, the dining room table was used for sorting mail, the file pile and organizing receipts for taxes. I knew that we needed to change this space, but I just didn’t know how. I etched a small list hidden in the corner on our bulletin board in the kitchen that held a glint of the vision I held. Several weeks ago, Barton was away for the weekend at a seminar, and I couldn’t help it- I went into overdrive. I moved all of the furniture out of the dining room, stacks of books piled high on the table now in the middle of the living room. By the time Barton came home, I had changed the covers on the chandelier lights and figured out how to raise them, set down carpet padding and two layers of canvas tarp in the empty room. I had exhausted myself, more than once, moving heavy furniture and piles of books all on my own. After Barton had seen and approved the initial transformation (as there was no way I was moving it all back), I stapled down the carpet padding and canvas- hopefully to avoid the grinding and tangling under Barton’s wheelchair. I also decided that I was ready to let go of my mother’s dining room table and china cabinet. In the weeks that followed, it became less about the physical furniture and more about the ability to claim myself, who I am and what space I need to create, work, function, thrive. For others, this may be a simple task, but to me, it was a huge leap. For years as a child I would switch from my mother’s house to my father’s house, with separate clothes, beds, animals, separate lives. It wasn’t until college that I even considered the idea of having my own space, and later after my mother passed away, realizing that it was okay to move the furniture out of its place. This current overhaul is just the next evolution. It required me to let go of having a “normal” house. My father and stepmother love to host parties at their house, a room full of family or guests around their dining room table. We’d love to do the same, but frankly it never happens that way. 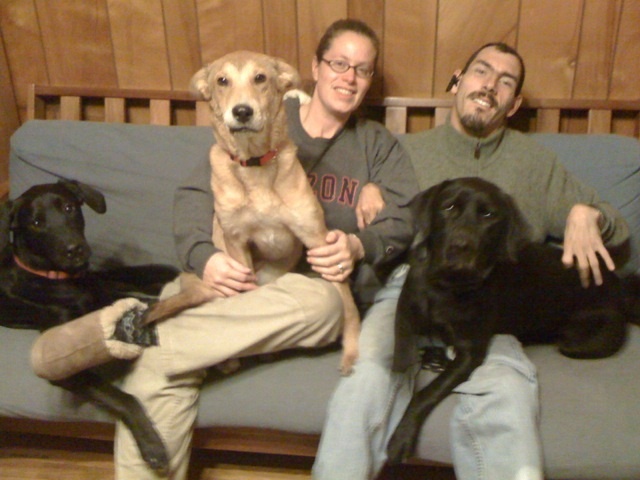 Typically, we go to others for a social engagement, and when we do have guests over, I have to explain that coffee tables and chairs just get in the way or the dogs just tore a hole in the futon. So we sit outside on our back porch enjoying the pine trees at dusk. During this most recent transformation, Barton was amazed as I was able to let go of some additional pieces that I was adamant about holding onto, and we even moved the bedroom around. 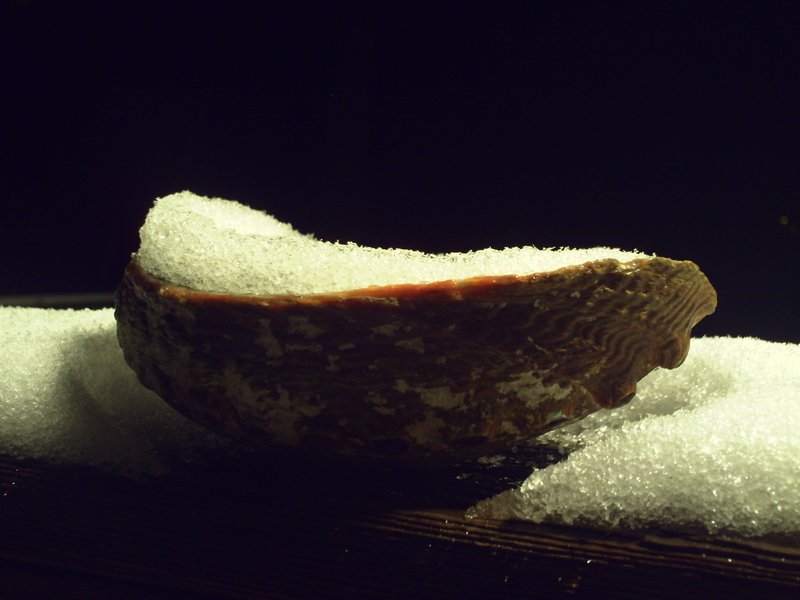 The last few days, we’ve walked through the house amazed at the light and spaciousness that we both feel. There’s more work to do, as one day, I’ll be brave enough to splatter paint the canvas floor covering. Until then, we’ll revel in enjoyment in this newly discovered space. What does the new year hold in store for you? This evening, our friend came over to help us hang a huge white dry erase board in the kitchen. As we begin a new year, it was time for a reminder; apparently we needed quite a large one. I admit, last year I would come home [after getting up at 3 or 4 in the morning], we would eat dinner and I would crash on the sofa watch all the mainstream tv shows, one after another until I fell asleep. It would take Barton nearly an hour to wake me, drag me off the sofa and into bed. The winter has been harsh with weeks of near record lows and multiple snows, and I’ve wanted to hibernate since November. Yet, there has been much to do, and much to look forward to this next year. A few weeks before Christmas, I was feeling low, and in the morning conversation with Barton, we realized we needed an overhaul. The next day, and I know this may come as a shock, we disengaged from the television. Now we still have and watch movies, but I needed a break from the traditional outlet overload of information. I realized that watching news shows, even the evening shows- was making me extremely anxious all of the time. Yes we know the economy is horrible- we are all living in it, yes we know the world is full of horrible people doing horrible things. And on some levels I can differentiate that from my own life. But I realized that I was absorbing anxiety, fear and despair, which was not what I needed to contribute to the creativity I rely on everyday. Barton and I came up with a list of things that we would like to do instead, both in the morning and the evening. It’s a fairly simple list, and includes both items we wanted to do individually as well as together. We rearranged our day and spent the morning coming up not only with a new daily schedule, but also new goals for the year. What had we accomplished in 2010? 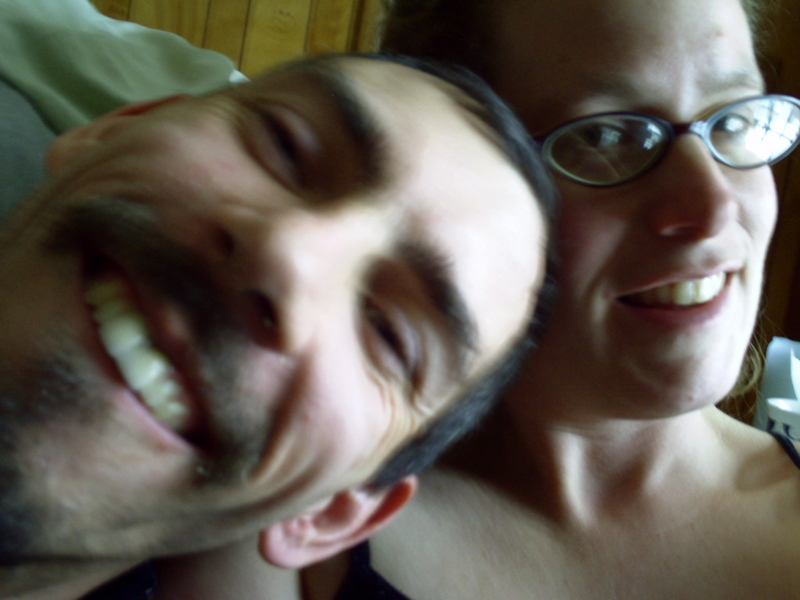 How far we had come as a couple and in our own personal development. What are places where we still need some work? Financial sustainability, a family. We had fun dreaming up plans, nothing was off limits. And I realized how important it was not only to be giving ideas, but to hear Barton plan and dream about our lives together as well. Since then, we’ve both looked back at the board- it’s a reminder as to keep us on track. Now there have been times where I’ve kept a list that was nearly impossible to keep, so here, instead of feeling like we have to do everything, we try to fit as much as we can in the day, but let go of the rest. Even in the week since the holidays, we’ve felt refreshed at the times spent together and working on other things in the morning and evening times. I have felt my concentration return to my creativity, and the uncontrollable fear has subsided into something more manageable. We’ve met at a local coffee shop- completely dismantled our manuscript and began writing again, together. How much fun the work became. What dreams and goals do you have for the new year? Take out a scratch piece of paper, computer file, dry-erase board, collage, whatever fits your style- and create your vision for the year. This Christmas, we had plans to travel to Atlanta, to see my family. It was the first time to see my dad’s side of the family for a long time, and I was so excited about traveling down. But sometimes the best plans fall by the side of the road. With snow threatening North Carolina, Barton & I decided to stay home. Though, we did decide to kennel the dogs anyway- they needed to play with other dogs, and I- a much needed break from the pack of three- the ol’referee (Bear), the wild child (Basho) & the little one (Beowulf). I had been pretty exhausted from the past couple of weeks & with a few powerhouse weeks coming up full of potential and possibilities as the new year begins, what I really needed was a break. On the way home, we picked up a pile of firewood, and along with every other neighbor in town, hit the grocery store. Even the staff at the store was unprepared for the Christmas Eve mob. Instead of driving seven hours to Atlanta, we plopped ourselves in front of the fireplace and I melted into a soft noodle. Is it pathetic to say that by 7:30pm Christmas Eve, Barton was pulling me off the sofa to go to bed? Christmas Day we had fun with friends at a Christmas Day party, and returned home full of laughter, smiles and way too much sugar. The snow indeed came to The Triangle. My half-hearted efforts to shovel off the porch was even more delayed by Barton calling me to add another log to the fire. Today has been a movie day, and as Barton put it- a romantic get-a-way without getting away. 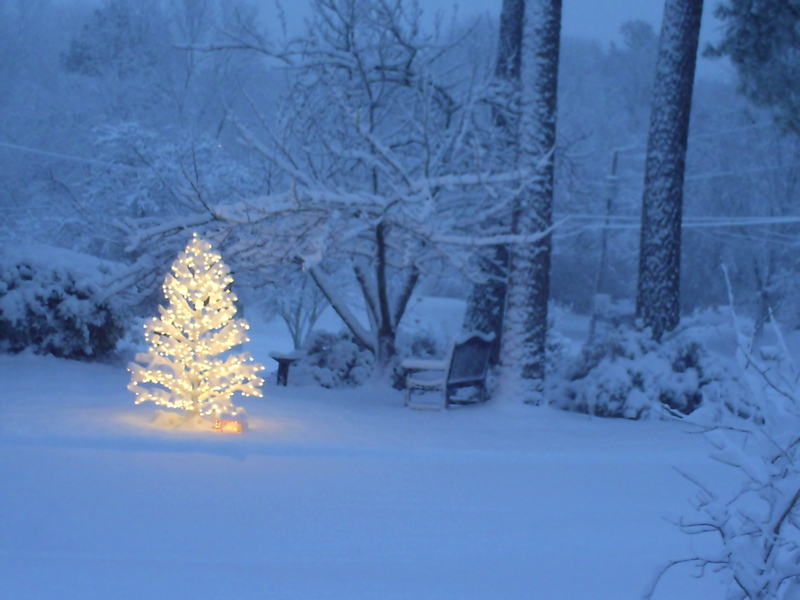 Complete with fire, love by my side and looking out the windows at the snow-lined branches, it feels like Christmas. Christmas was my mother’s favorite holiday, complete with many gifts to unwrap. Instead, I wrap my arms around Barton and am thankful for what we have in our lives. We experience challenges everyday, but we return to the love and life we have found with each other. It’s more than I can ask for. I have been pulled off the sofa every so often- taking the camera for some pictures of the white fluff, and the short trips outdoors- to push the Camilla bush off the ramp, a few snapshots and a breath of snow-filled air, and while Barton laughs at my need to organize and clean, I will return to my spot on the sofa in front of the fire. Tomorrow we will wade through the snow soaked roads for a list of errands and to pick up the pack, and hopefully by then the roadways will be clearer, and we’ll be ready for the challenge. Merry Christmas everyone- we hope your Christmas or winter celebration was filled with family, friends and love! We’ve received some inquiries recently about how I take care of Barton, which are great questions. But I thought this would be a good time to dispel some myths and open the discussion for care taking in a marriage. While we all like to think that our partnerships are 50/50% equal, most likely- they are not. And the balance on who is holding the weight fluctuates according to what is going on at the time. We each need different things at different points in our marriage (disability or not). Every inter-ability marriage is different, so before sharing our perspective and experience, we want to be assured that in the end, you and your partner must find your own way that works for you. In our relationship, it is essential that as much as possible Barton and I honor the husband-wife relationship as being separate from actual caretaking that he or I may need. Certainly, Barton needs help in the morning bathing, dressing, basic hygiene, and we either find private personal care assistants, organizations or even friends to help fill this role. Over the years, Barton has had a number of personal care assistants, and he runs this process from interviewing, hiring, reviewing and in some cases firing assistants. It is an on-going process that must be maintained, and while it is not always easy, Barton values having someone other than me heading up this role. We are also aware of the times when I do help Barton get up in the morning- how that affects my day- physically, time, and energy level. In addition, we have found that it very subtle ways it affects our connection as husband and wife, so we work very hard to keep me out of the sole care giving role. Perhaps the bigger question is how we define care taking in a marriage. We would argue that there are many other forms of taking care of each other in our marriage. Picking up dinner, running errands, grocery runs, bank deposits and other daily tasks is one area that when I am having a bad day or crazy week, Barton takes over- and I can’t tell you what a blessing it is. On a particularly difficult day, Barton emailed me a poem he had written, and I will say it was exactly what I needed at the time. Allowing myself to become vulnerable and fall into Barton’s arms is another. A reminder to do meditation or to take time out for ourselves so that we can find our center is also a vital part of care taking. I am pulling out all of the things that Barton does for me, to take care of me because most people wouldn’t even consider it when they comment, “You are so good to have married him.” I want to say, “I am so blessed to have Barton,” but I know that explaining how or why will fall short. Our methods and systems will shift, when we have a child someday, as we grow older, if something happened to me. But we will figure it out, in a way that honors the care taking we both need in our marriage. 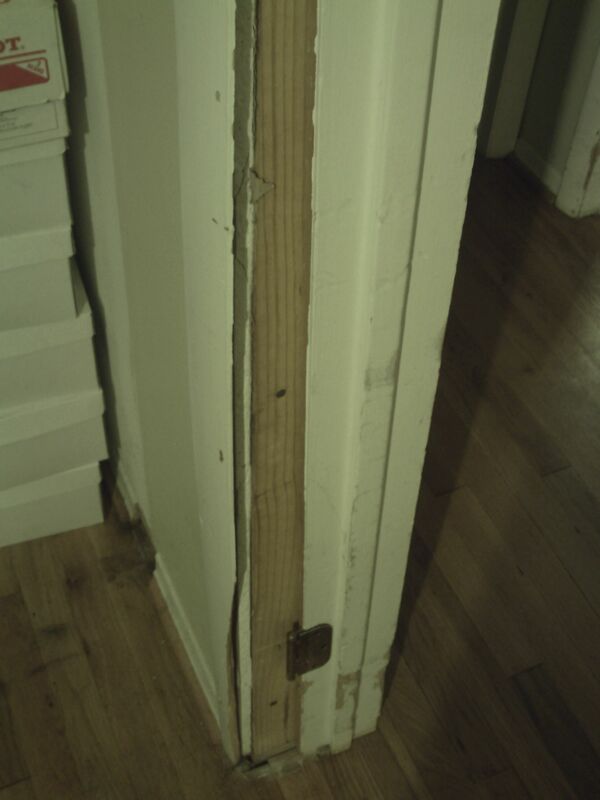 Before: The office doorframe, knocked out of place. This weekend, we took the plunge- we had a no-hole fix-it repair weekend. We have always laughed about the holes and dents in the drywall from Barton’s wheelchair. 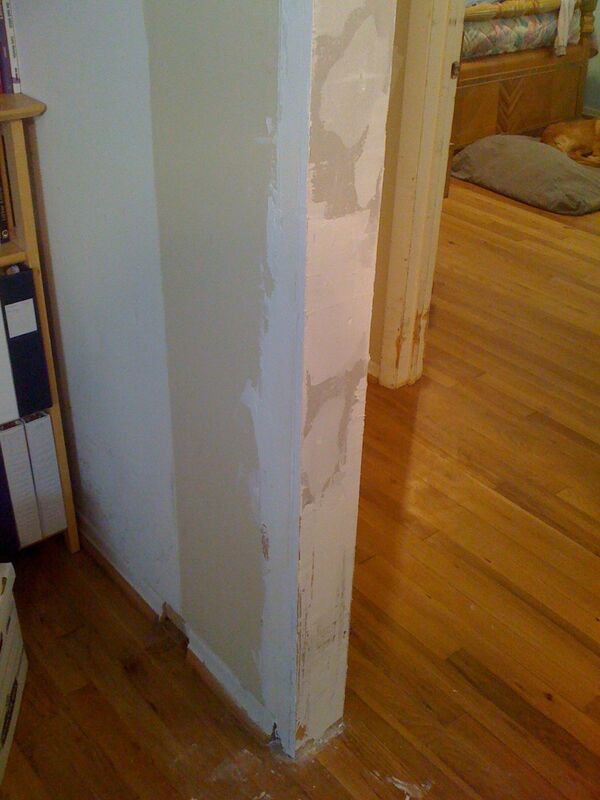 Every one has a story behind them and trust me we keep count of who makes each dent and hole in the hallway- a source of constant chiding, but it was time to repair the damage. What a whirlwind of an afternoon, and we were so grateful to have help, as I couldn’t have done these projects alone. From taking the doorframe off to the office, spackling dents and dings in the hallway and bedroom, installing a new smoke alarm, yard work, installing a new blind, painting little items here and there, tacking up installation that had fallen under the house, we crossed off a number of repair items that had been on the list for quite a while. Afterwards, as Barton and I crashed on the sofa, we felt as though we had just had an Extreme Makeover Day, and we had. These were projects that were on the list, but so many other priorities have taken precedence. Especially as we have been shifting the focus of our vision and mission, moving into new areas of work and exploring new possibilities. Yet, going back to take care of these items is necessary, and part not only of home-ownership, but of preventing future damage and cost. So often, you hear the term work-life balance. How do you balance all of these aspects to our lives- work, family, home, volunteer/service, relaxation and rest? I haven’t quite figured it out yet, but I love how poet David Whyte talks about these aspects of our lives in conversation with one or another. It’s not either or, but rather how they overlap and interweave throughout our lives. What I loved about our no-hole repair day was not that it was just marking items off a list, but that it brought pieces of our community together. We met new neighbors and spent a lot of time getting to know them, we laughed with other neighbors about inside stories they knew, and we reconnected with a family we had not seen in a while. A little boy and girl helped me carry brush out to a pile we made in the yard teaching them about helping others, and there were extra pairs of hands accomplishing items we could not have done alone. What can we accomplish with the help of others? I’ve been known to have an, “I can do…” attitude, which on one hand is important to be determined and persevere, but on the other leaves out the potential to succeed as a communal effort. Community is important, and I’ve found that there are different communities for different parts of my life. This ties directly in with finding a support system or network, which can be found in a variety of places- neighborhood, spiritual or religious based, organizationally or interest-based. It’s easy to say, “I’m so alone. No one has been here, done this, experienced this…” Yet, in this day, we all have experienced the changes due to volatile economic times, we all in one time of our lives or another will experience a loss or tragedy, as well as the joy of success. What do you need to accomplish with an extra-pair of hands? Gather some friends together, tell them what you need and see what the possibilities are. You may be amazed at what can happen. Barton walking the dogs, on a normal ride. On the one hand, there were many moments this week when I felt myself become tense because my perspective of what I thought should be happening at that moment was not what life was allowing me to do, such as when I was lying on the floor laughing and playing with the dogs when I had hoped to be working on a project for work or when I was stuck on the side of the road trying to figure out the best way to get myself home when I was under pressure to get home before a phone meeting. On the other hand, I certainly had my share of moments when I found myself embracing the situation and playing within the moment. Moreover. During the course of the week, I found myself learning to roll with the punches to a greater extent. On Tuesday, after Megan so kindly peeled me off of the floor, my agitation around the lost work time got the better of me, and it took Megan calling me out for me to actually recognize what was going on. 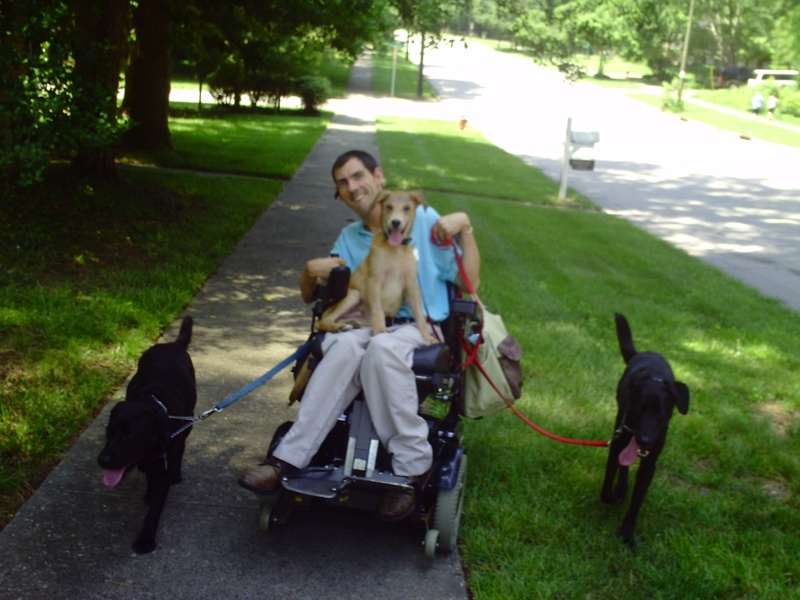 By the time I found myself stuck in the street with the broken-down wheelchair, I was better able to remain patient in the moment and be present to the way in which the afternoon progressed. When I read the email from my friend, I had to laugh out loud because it became clear that while I could see some slight improvement over the course of the week, I know I still have far to go in developing both patience and courage.